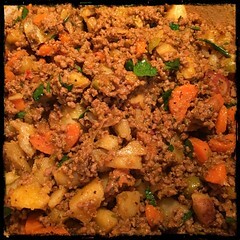 Carne Molida is a Puerto Rican Style ground beef recipe that’s similar to the Spanish or Cuban picadillo except the Purto Ricans added the potatoes and carrots. You can use Carne Molida as a topping for rice (that’s the way its traditionally served) or as a filling for tacos or burritos. 1. Preheat 2 tbsp olive oil an cook ground beef, seasoning with Zio’s Adobo, salt and black pepper. 2. Once ground beef is simmering add 1/4 cup Zio’s Recaito, 1/4 cup tomato sauce and 1 tbsp Sazon. Mix well and let simmer 2 minutes. 3. Add the Manzanillo olives, cubed potatoes and carrots. Mix well and cover pot. 4. Set heat to low and let simmer, mixing often, until potatoes soften. 5. When potatoes are cooked add some fresh flat-leaf parsley.